Acer, in an attempt to maintain its superior reputation in laptop manufacturing, has announced its ConceptD 9, ConceptD 7, and ConceptD 5 trio of laptops. The devices are primarily targeted at individuals who work in creation or design. The main focus of the laptop series is to provide screens worth boasting high color accuracy and color-space coverage. The ConceptD 5 is the entry-level model. The model can be fitted with an 8th Gen i7 CPU, AMD Radeon RX Vega M GL graphics, up to 16 GB of RAM and up to 1 TB NVMe PCIe SSD storage in a RAID 0 format. Despite being thin and light, the laptop has a 4K UHD display and will cost from US$1,699 (from €1,699 in European markets, 12,999 yuan in China). Its availability begins in June (North America/China) and July (EMEA). The second on the list is the Acer ConceptD 7. This model comes with up to a 9th Gen i7 chip and the Max-Q version of the GeForce RTX 2080. The 15.6-inch laptop aims to satisfy the creative type of users. This is ensured by its 4K display which is PANTONE-validated and covers 100% of the AdobeRGB color space. 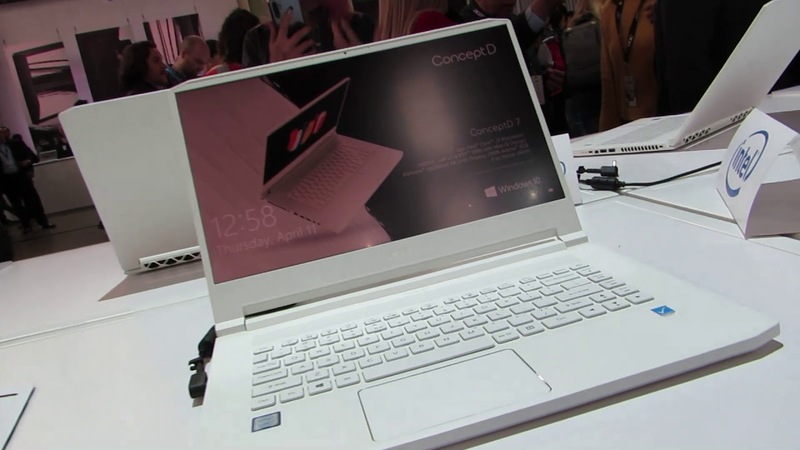 Acer has also designed the ConceptD 7 to be reasonably mobile. The laptop weights at a remarkable 2.1 kg/4.63 lbs and is just 17.9 mm/0.7 in thickness. The price for this laptop starts from US$2,299 for North America, €2,299 EMEA, and 19,999 yuan in China. Acer plans a May release for this device in China, with July targeted for North America and EMEA. The Acer ConceptD 9 laptop is a beast of a machine. The laptop features up to a 9th Gen i9 processor and Nvidia’s high-end GeForce RTX 2080 GPU, consisting of 32 GB of RAM (DDR4 @ 2666 MHz) and up to two 512 GB M.2 NVMe PCIe SSDs in a RAID 0 configuration. The great components in the laptop highlight the supremacy of the incredible 17.3-inch Ultra HD (3840×2160) display that coves the AdobeRGB color space by 100%. An included Wacom EMR stylus with 4,096 pressure levels will help designers create works of art on the professional-grade screen. Along with the premium parts, the Acer ConceptD 9 laptop has a fascinating form factor. The display is capable of flipping over, extending from the keyboard part, or even reclining. 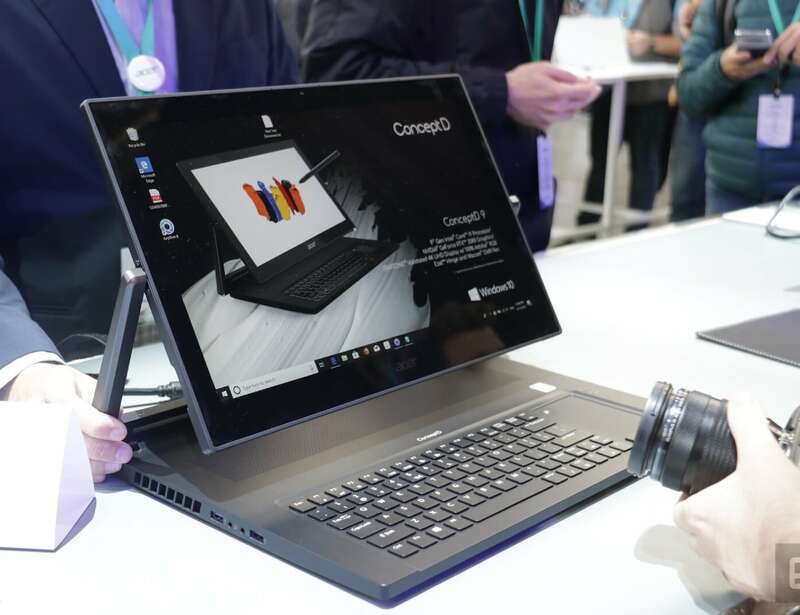 Acer has installed what it calls the Ezel Aero Hinge, which is an appropriate name as designers and artists can utilize the ConceptD 9 in a similar fashion to an easel. Unsurprisingly, this technology doesn’t come cheap: The laptop starts from US$4,999 in North America, €4,999 for Europe/Middle East/Africa, and 49,999 yuan for China. Acer will make this powerful creator notebook available in August.